Today I'm going to take you to a site on the Giza Plateau, which is 6km from north to south and about 2km wide, that of Saqqara (29° 51' N, 31° 14' E, for those who want to look at the satellite views), southwest of Cairo, near ancient Memphis. I'm not going to talk about the famous Step Pyramid of Djoser (3rd dynasty, 2630 BC officially) built by his grand vizier, Imhotep, or of one of many mastaba that there are - no, not this time. I'll let you discover one of the most mysterious places in Giza, and the whole of Egypt ... the Serapeum, these strange catacombs. 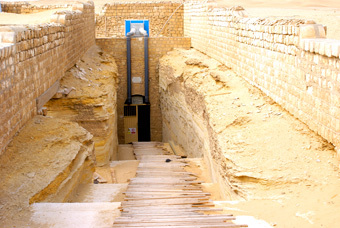 Look at the view from above: the entrance to the Serapeum is almost in a straight line well above the small Userkaf pyramid and slightly on a diagonal above the great step pyramid of Djoser. I deliberately chose this picture from 1957 because now the ground in this area is so dug over, excavated by archaeologists' concessions, that it would be difficult for you to see where the entrance is. 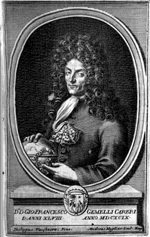 Then a great Italian traveller, Giovanni Gemelli Careri, seems to have seen or at least approached it, in 1693. 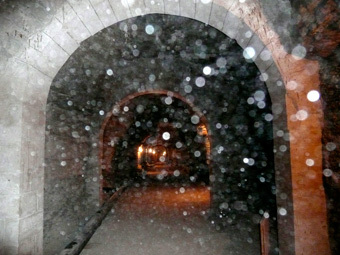 He spoke of "a subterranean labyrinth" he saw, "not far from the pyramids". 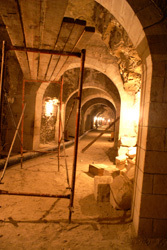 But we think he saw other catacombs, not the Serapeum itself, or rather one of its extensions because he spoke of corridors running "for miles like a city under the ground". He added that the Egyptians he had met called this place "the labyrinth", not to be confused with the famous above-ground labyrinth at Hawara in the Fayum area. 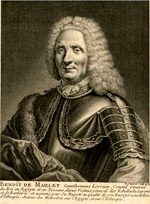 At roughly the same date, Paul Lucas, a French merchant who bought up antiquities on behalf of Louis XIV, found and visited the site and spoke of galleries already collapsed. 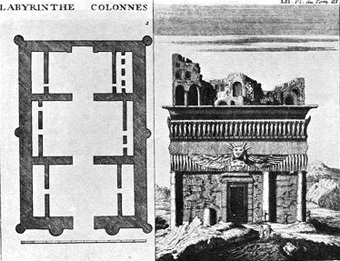 I think Benoit de Maillet, Consul of France in Cairo from 1692 to 1708, also saw this place, but as you will see, it was very difficult at the time, when nobody could read hieroglyphs, to identify and understand it. Up till now it's been a great puzzle to researchers, perhaps even more so than the Great Pyramid itself. Also the place is closed to the public and you need a special permit to enter. By visiting this site through this article and the next you'll enter a world of high strangeness; you can judge for yourself. Note in passing how the French became interested in Egypt, well before Napoleon. If anyone has given its letters of nobility to the Serapeum it is our dear Auguste Mariette (1821-81) who discovered the complex on 1 November 1850. 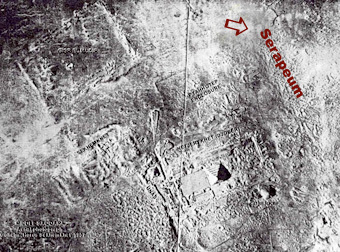 If only a few years earlier, Napoleon had searched frantically for the Serapeum, without success, it is because something special must be there. In fact Mariette's discovery, made almost by accident at first, changed his life, and after this he decided to devote himself to Egyptology. The discovery must have been of great significance to inspire such a vocation - another clue to the importance of the site. 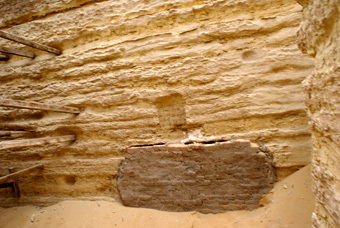 Mariette had read the Greek Strabo who described some of the Egyptian buildings first hand. His description of the avenue of sphinxes at Saqqara and the mysterious Serapeum to which access was virtually impossible had aroused Mariette's interest. So he decided to take a look in the dune-covered northern part of Saqqara. This was the right move because he soon came across a small sphinx half buried in the sand, a prelude to the famous avenue leading to the famous Serapeum. Given the competition, there was no time to lose. And so, as he loved to recount: "(...) on 1 November 1850, during one of the most beautiful sunrises I've ever seen in Egypt, with a group of thirty men working under my orders near this sphinx..." he found as the days went by about a hundred of these small sphinxes on each side of an avenue that began to take shape before his very eyes forming a classic dromos, a sacred way leading to an important place. He soon came to what he described as a courtyard of the ruins of a small temple. There he found the famous statue of the seated scribe who is now in the Louvre, and a statue of the god Bes, whose name ("bs") signifies "to be initiated, to be born" and whose ugliness was believed to repel evil forces. 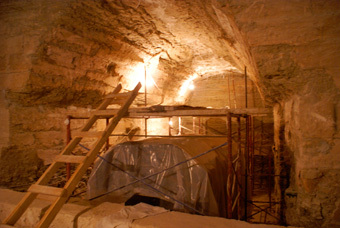 Eventually, on 12 November 1851, only a year later because of the tons of sand to be moved, he found lower down the real entrance to the catacombs of the Serapeum. 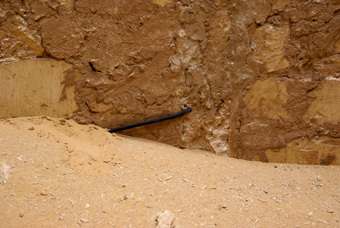 Look closely at the pictures of the site as it is now, the place is still totally buried below the level of the dunes. Mariette had to use explosives to break through the rock of the sealed entrance. 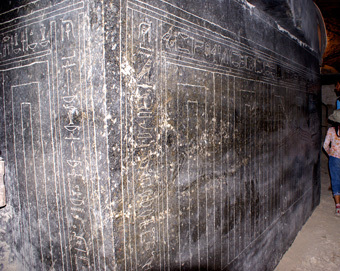 He then entered a long gallery containing niches with votive stelae and 24 side rooms, like alcoves, each containing a huge dark granite sarcophagus. These sarcophagi were nowhere near human scale, as to reach the top one has to climb a ladder of at least eight full steps; I checked it myself. In addition each sarcophagus, carved from a single block of granite, measures 4m long, 2.30m wide and 3m30 tall and weighs about 80 tons, proof of a remarkable feat of technology. We are told that these sarcophagi are the tombs of mummified sacred Apis bulls of the 26th dynasty (664-525 BC) up to the Ptolemaic period. These huge sarcophagi are therefore supposed to have been receptacles for the mummified bodies of bulls that in real life would not have been much more than 1m60 high over all and would have weighed as an adult about a tonne at the most. The least one can say is that these granite sarcophagi were oversized compared to their supposed content. Strange, isn't it? We will come back to this. 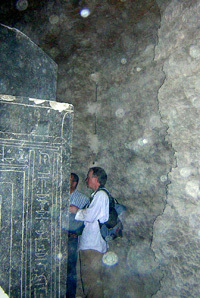 We are also told that the granite sarcophagi are empty (it's true, I was able to check on the spot). Supposedly their contents were looted in antiquity. They were thus found as they are now, that is to say empty, with no signs of any mummified bulls - keep that in mind. Marietta also found that most of the lids had been moved. At this point we can already see a lot of questions raising their heads - but before we go into them any deeper, let's look at something else: why this worship of bulls? "Serapeum" comes from Serapis, a composite god Sokar-Osiris-Apis created on purpose by the late Pharaoh Ptolemy I Soter (305-282 BC after the 31th dynasty). The Pharaoh had a major problem to solve: he had to reconcile and unify two different cultures mingling in Egypt, the Egyptian and Greek. Thus the new cult of Serapis was created, combining the ancient Egyptian cult of the Apis bull with the ancient Greek cults of Zeus, Hades, Asclepius and Dionysus, trying to bring them all together into this composite god who represented fertility and the powers of the underworld. So why the deified bulls? To the ancient Egyptians the bull Apis contained the divine manifestation of the god Ptah, and later of Osiris. The Apis bull was thus the actual receptacle selected by the soul of Ptah to come and incarnate in our Earth density. 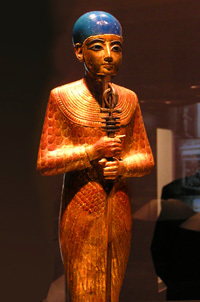 When Osiris later absorbed the identity of Ptah, he symbolised life in death, that is to say, resurrection. The Osiris living in the underworld is also the Osiris of fertile vegetation, he who has conquered evil and death. All these associations between similar gods through the centuries, common in Egypt, actually have a very important meaning, a significance that sometimes contains more than one secret. Thus the Babylonian god Ea was called "Serapsi", that is to say "King of the Depths", which also relates to our Egyptian Serapis. But back to the god Ptah, the former Atum, demiurge, "creator of the World", "the one who shapes", who builds, "the Divine Architect of heaven and earth", "the possessor of creative fire." On the Shabaka Stone it is said that Ptah "brought the world into existence." The equivalent of Ptah for the Greeks was Hephaistos and for the Romans Vulcan, also identified with Zeus. Ptah is represented standing upright wrapped in the shroud of mummification, like Osiris, which to me clearly indicates that he resides in the underworld. He does not have the freedom of movement that one has on the surface of the Earth. He is a prisoner of a place and a form that was not his in the beginning. The fact that he is wearing a blue cap (which the blacksmiths adopted later on) shows that he is invisible when on the surface of the Earth. In ancient Egypt the colour blue indicated things and beings that were invisible. Thus Ra was originally depicted in blue, as was Amon. It is the blue of heaven, associated with the creative breath of the life. Ptah has mastered all the secrets of manipulation, which gives him the power to dominate and shape all matter. A chthonic god, he reigns over the minerals in the depths of the Earth. Another important link, he is also associated with Ta Tenen, the island rising out of the submerged land (which brings us back to the Great Flood, or to several of them). In any case, he is a god who was present when the first land appeared above the waters - and who perhaps in order to manifest on Earth has to enclose himself in a form, so why not choose the form of the bull Apis? His consort was Sekhmet "the Powerful", "Great in Magic", the feared and untameable lion. Guardian of the threshold, protector of the gods, warrior that Ra did not hesitate to send to punish the people on earth who no longer wanted any contact with the heavens and were cutting themselves off from the divine. Some texts even give the impression that she had a part in unleashing the Flood. Then in the Greek tradition, let us not forget that there is the disturbing story of the nymph transformed into the cow Io by Zeus (associated with Ptah) and who, after an epic journey, ends up arriving in Egypt, where Zeus (Ptah) gives her back her human form and where she gives birth to Epaphus (the Egyptian Apis) and spreads the cult of Isis. The Egyptians associated Io with Hathor, and according to some researchers Epaphus-Apis became king of Egypt and founded Memphis and was venerated as the god Apis. Strange, aren't they, all these interconnections? In any case, from this story we also learn that Zeus was willing to turn himself into a bull at times. So here we have a divine being Ptah, linked with the underworld, linked with the creation of the world or its re-creation needed after the Flood, and his consort Sekhmet, who also has a link with the Flood. But what further explanation is there for the Apis bull and the sarcophagi in the Serapeum? Let's look at what we know from the texts. This descent of a god into a body of animal flesh on Earth gave rise to all sorts of very strict rules. 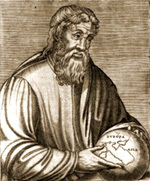 Herodotus even tells us that the Apis is "a calf from a cow that cannot bear any more offspring. The belief of the Egyptians is that a flash of lightning descends upon the cow and makes it receive Apis." Priests scoured the whole country to find such a calf. Once he was found, he was carried down the Nile to Memphis by boat, housed in a magnificent golden cabin. There followed a great celebration because it meant that the living god had come to incarnate in the country; it was a tremendous honour and great joy. A seven-day feast was held to mark his entry into the temple of Serapis, after which he had an easy life, with tasty delicacies and priests in his service, a harem herd available, music, jewellery to adorn him and great popularity each time he was led out in grand style for festivities among the cheering people. He was so handsome that Plutarch wrote, strange as it may seems to us today, that "Apis is a beautiful image of the soul of Osiris." If he accepted the food you handed him, if he extended a particular leg for instance - everything was matter for interpretation. He was also revered because in the afterlife, anyone who was under his protection had control over the four winds. Also, according to my research, the Apis is linked to what is called the sign of Tanit. Tanit was a moon goddess of fertility, birth and of the city of Carthage, of Phoenician origin. Her shrine is at Serepta (still close to the word "Serapis") in southern Phoenicia, where she is associated with the goddess Astarte (Ishtar). And brace yourself, in Egyptian Tanith = Ta Nit, that is to say, "the land of Neith". The goddess Neith was another warrior, who also watched over the mummy of Osiris, thus a goddess who fights and is connected with the underworld and resurrection. There's always this tangle of deities in different areas and different eras. But if you look at the whole picture, it's always about the same thing! And everything takes us back to Egypt. To help you understand why the Apis was related to the sign of Tanit, first look at Apis as he was usually represented, gilded with the solar disc between his horns; then now look at the sign of Tanit - the bull seen from the front represents the crescent moon (the horns), the sun (the disc that he was always adorned with) and the pyramid (his triangular snout). According to the Phoenicians, the whole thing was represented by a person raising his arms in prayer to the heavens. I should add that in the secret language of the Egyptian priests, the symbol of the sun meant "look at what is fixed (the divine)", and the symbol of the moon meant "look at what is changeable, mutable (the incarnation)". So we are faced with the notion of the animal being the very representation of prayer to the heavens, of the link with the divine, of the ladder to the sky. What other animal could serve so well as a link with the gods? In addition, the design forms an Ankh cross with the central line split in two at the base, which some believe could be the Ankh sign of life in its very distant original form. A bull then as the symbol of life linked with the sky, linked with resurrection and better still, with ascension - we're just beginning to glimpse why so many important people have been interested in the Apis and the Serapeum. The rites surrounding the Apis were considerable. There was even a rite of baptism practiced in Rome much later, when the cult of Apis gained much success. This ritual was very similar to the Christian one. What's even more significant, the word "bull" is pronounced "ka", exactly like another ka, the one that according to the ancient Egyptians represented a person's double and held their creative energy. Each living being had its own ka and the Egyptians said in the texts, "To die is to pass into your ka". It is no coincidence, everything is a deliberate game in Egyptian writing. The ka was represented in hieroglyphics by two arms raised to the sky, a symbol seen also in the hieroglyph of the bull. So in the symbolic role given to this animal the Egyptian priests revealed a favoured pathway to the divine and a means to reach eternity. We are thus faced with a place that speaks of resurrection, ascension and eternity, and one that is hiding more than a few secrets. To help you understand even better the interest certain people have taken in this place, let me tell you that Mariette's first reports - the detailed discovery of each sarcophagus, each grave, each new underground passage, all through several years - have completely disappeared. This again will not surprise you if you've been following my writings for a while. Everything significant on the Giza plateau tends either to disappear, or if it can't be moved, to be closed to the public. 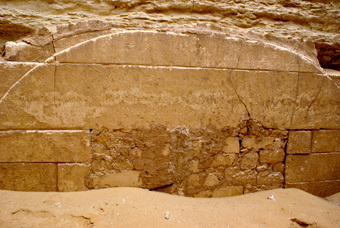 Among other things, all along the outer walls of the Serapeum there are dozens of openings more or less effectively sealed up, some with electric wires coming out of nowhere, overlooking places that one cannot visit, not even with special permission such as your present guide obtained. On the inside these places are walled off, hidden behind heavy wooden panels and inaccessible. Since it was discovered some years ago that the workmen repairing the corridors of the Serapeum were exposed to breathing in excessive doses of radon (28.83mSv/year instead of the maximum of 10mSv/year), the site has been closed to the public. However, I've seen the whole air circulation system and everything has been working wonderfully well for quite a while. We'll talk again about all this in detail, and to do so I'll have to tell you about the mysterious Imhotep, architect of the pyramid of Djoser, and about Prince Khasekhemwy, a son of Ramses II who was one of greatest priests and magi of all Egypt, and I'll have to tell you about Aesculapius and the snake - and maybe then we will begin to better glimpse of what might have happened in this incredible place. And if you can, do go and take a look at everything to do with the Apis bull in the Louvre or in the British Museum.